Datalogic PowerScan RF - High density, 915 MHz, RS-232, Keyboard wedge & wand emulation interfaces. Includes battery. Order base station, power supply & cables (host to base station) separately. See accessories. 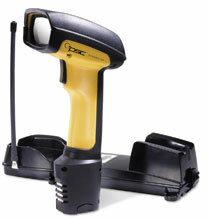 A wireless barcode scanner to go where the work is. With the PowerScan RF wireless scanner, you now have the freedom to go where the work is, not the other way around. Now you only have to take the 27.5 oz. (0.8 kg) PowerScan RF scanner to the 500 lb. (227 kg) pallet, not the pallet to the scanner. Utilizing the latest in Radio Frequency (RF) technology, the PowerScan RF has a range of up to 150.0' (45.7 m). This allows you the freedom to scan pallets at the other end of the loading dock or boxes at the end of a warehouse aisle up to 150.0 (45.7 m) from your fork truck. Its unique acknowledgment tone lets you know that your data transmission was successful. With multi-point capability the PowerScan RF allows you to assign multiple scanners to a single base station thereby increasing throughput and reducing the cost of additional base stations and host terminals. Each unit ships with one user's guide. The Datalogic PSRF-1100 is also known as Data Logic	PSC-PSRF1100	or PSRF1100	.